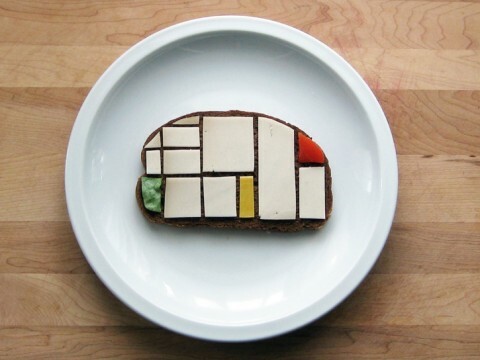 This Mondrian inspired Sandwich made me laugh. This might be my new way of sending subliminal art messages to my daughter with her lunches. Looks better than it tastes I bet! genius. restaurants should take note. Don’t forget to follow it up with a piece of Mondrian cake for dessert! Uhm…De Stijl allows only red, yellow, and blue. Why is there a green piece? Yeah, Mondrian would never use green. He broke up with his best friend Theo van Doesberg for wanting to use curved lines. (Or was is diagonals?) Green would make him pop a capillary! ha ha ha we created a white on white Malevich sandwich with white cheese on top of a slice of white bread! it was for the second anniversary of BeaMalevich! RE:green on the mondrian, as a sandwich expert (i am the author of http://www.sandwichaday.com) i can say that there are not many widely available or well known BLUE ingredients that would also taste good on a meat, cheese, moutarde sandwich. i’d call it artististic freedom. So fun and wonderful! As a fellow Swiss (half) artist in the US I salure you! Hup Suisse! Thanks for the awesome comments. About the green–I know, I know. I debated about using blueberry jam or something, but I really wanted these to be sandwich fixings that went well together. Any suggestions for an alternate ingredient? Now that’s a tasty piece of art. A feast for the eyes as well as the stomach. I had a Rothko lasagna today. It was delicious.